Common Reasons Why Tennessee DUI Cases Get Dismissed | Raybin & Weissman, P.C. When you are arrested on a suspected driving under the influence (DUI) charge, you could be looking at serious penalties if you are convicted. Thankfully, there are steps you can take to attempt to clear your name of all charges and avoid a conviction that could follow you for years. There are several potential drunk driving defenses that can be used to build your case, and your criminal justice attorney will work with you to determine which defense is most likely to result in an acquittal or reduction in your charges. We have gone into greater detail about some of these defensive strategies below. An unlawful stop means that law enforcement had no valid reason for pulling you over in the first place. For a police officer to pull you over, they will need to suspect that you are committing a crime. If you were to, say, run a red light and were subsequently pulled over, then this would not be considered an unlawful stop. But, if you were pulled over due to racial profiling or because the police officer had to meet their quota, then it is quite possible and plausible to argue that the police officer in question did not have probable cause to pull you over on a DUI suspicion. When you were pulled over for suspected drunk driving, you were more than likely required to submit to a breathalyzer test that gave the police officer your blood alcohol levels. However, if the police officer did not administer the test correctly, then these results may not have been entirely accurate. It is also possible that any blood test results could have been skewed or not tested correctly. If this is true for your case, it should be relatively simple to dodge a conviction. You may or may not know that after you’ve had a few drinks, it can take as long as ninety minutes for alcohol to be absorbed in your bloodstream. The length of time can vary based on several factors, including your weight and how much food you have in your system. If you got out of work, had a glass or two of wine, and then headed home, it’s possible that the wine wouldn’t be absorbed in your bloodstream until a minimum of thirty minutes later. But, if you were detained by a police officer on a suspected DUI and didn’t have your blood alcohol levels tested until later, then it is reasonable to assume that you were not under the influence while driving, but that your BAC rose after you were stopped by law enforcement. 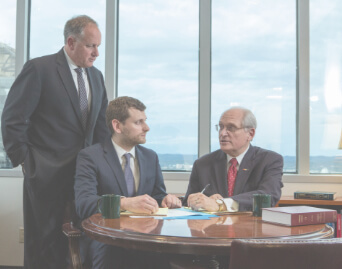 When you’re ready to take control of what could be a disastrous situation, you’ll need a high-powered TN DUI lawyer at Raybin & Weissman, P.C. on your side. We’ll be able to get started on your defense when you come in for your complimentary case review. This can be scheduled by reaching out to our office at 615-256-6666 or completing the quick contact form we have provided at the bottom of this page.